This new book is both inspiration and resource to get guys going with a personal practice. The popular BOYS OF YOGA website—featuring stories, videos, tutorials, and all sorts of yog-spiration is now a book! 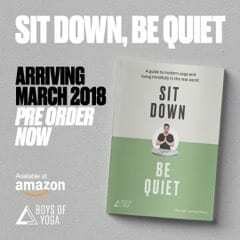 Sit Down, Be Quiet is an invaluable resource for yoga-curious men to learn how to develop a meaningful practice that fits any lifestyle. Check out BOYS on Instagram as well. Pre-order your copy today. Ever hear your guy friend use these excuses for not coming with you to class? Yeah. We have too. The revolution of men’s yoga isn’t only happening in Eastern Europe. According to a 2016 report by Yoga Alliance, there are more male practitioners in America than ever before—an estimated 10 million men in 2016, up from 4 million in 2012. 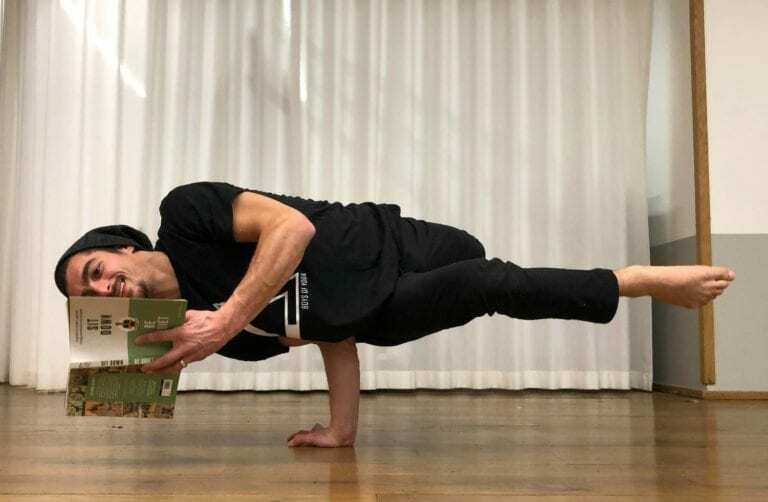 Wong founded BOYS OF YOGA (BOYS) in 2015 to help draw attention to these oft-forgotten practitioners—what he calls the uncelebrated minority of the yoga community. 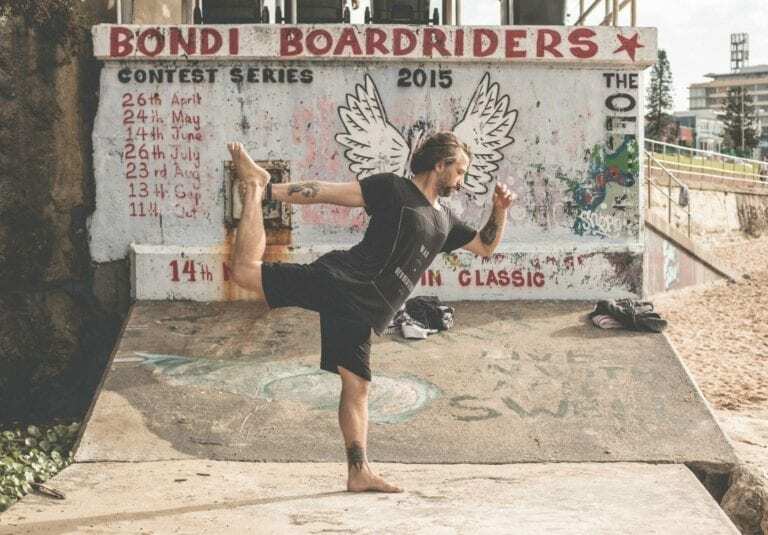 Through workshops, inspiring social media accounts, and an upcoming new book, BOYS is working to shift the stereotype of male yogis. Wong likens the idea of guys saying they “can’t go to yoga because they can’t touch their toes” to the idea that someone would refuse to shower because they’re too dirty, or refusing dinner because they’re too hungry. “When we look at it through this lens, yoga is exactly what guys need to do,” he says. BOYS’ Dustin Brown finding calm in the chaos. But it’s not just male yogis arguing that yoga is more than just floor stretching and a lifestyle of nut milk and crystals. Last year, the NFL released a film about Keith Mitchell’s journey from injury back to the field—using yoga as an integral part of recovery, and the National Hockey League employs yoga teachers for individual teams. We double (down) dog dare anyone to call these athletes soft. 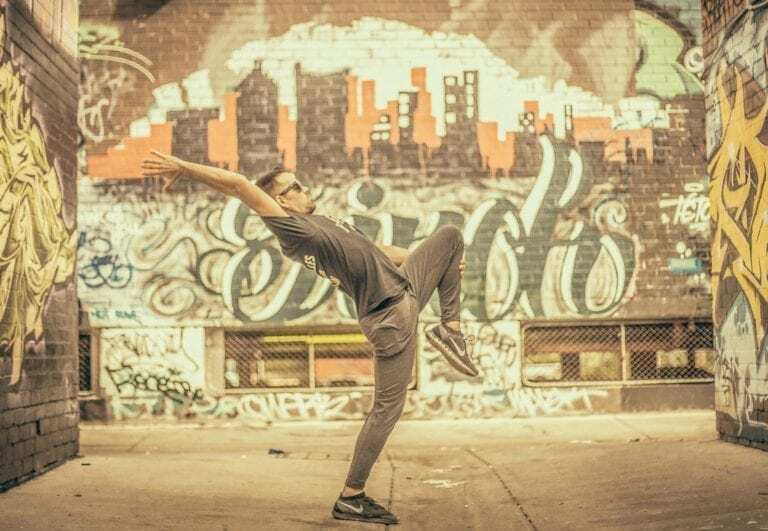 BOYS’ Adam Whiting demonstrating just how badass Dancer’s Pose can be. Ironically enough, when the earliest instance of yoga was recorded it was a male-only practice. The first known woman to be invited to study traditional yoga was Indra Devi, in 1937. It was largely due to Devi’s outreach that yoga gained such traction in the U.S., and the rest is history. Wong notes that the wave of interest from women really helped to bring yoga to the masses, which in turn encouraged a big upswing in the early wellness movement. But it’s time, now, to bring men back into the fold. “As we continue to grow in the ever changing world of yoga, I believe that BOYS is a project that is really about bringing the guys back to the conversation so that everyone can enjoy together. Yoga, much like life, is best enjoyed when everyone is involved and enjoying it,” says Wong. He hopes that one day a personal yoga practice will be as common as having a walking or running routine. And while he’s grateful for all the positive feedback he’s received as BOYS continues to shift the needle, he ultimately looks toward the day when the project will no longer be necessary. “I always believed that if the project can achieve what we set out to do, then in time it renders itself obsolete,” he says. BOYS’ Chad Dennis parking it in Chair Pose. The increasing prevalence of yoga among men resonates in this current moment. Wong believes that we are “in a phase of a cultural shift where our focus is moving to respecting ourselves as human beings; acting on and celebrating what makes us happy.” Indeed, the national dialogue about work-life balance—and doing what you love—has never been more urgent. It makes sense that yoga would be a part of that discussion. Be a part of the larger conversation! Be sure to check out BOYS on Instagram, and snag a copy of Wong’s new book to keep around for inspiration and motivation. 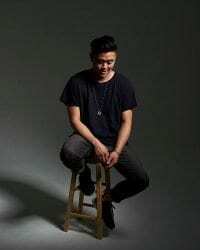 Michael James Wong is a Global Yogi, Founder of BOYS OF YOGA & JUST BREATHE and the recent author of Sit Down, Be Quiet, a modern guide to yoga and living mindfully in the real world. Michael is recognized around the world as a leading voice in the global wellness movement for yoga, meditation & modern mindfulness. Michael’s passion is to inspire the masses about the benefits of a mindful way of living on and off the yoga mat, every single day. Born in New Zealand, raised on the beaches of Los Angeles and now London-based, Michael travels the world as a keynote speaker, yoga teacher, and meditation guide bringing the benefits of modern mindfulness into the real world. Michael’s relationship with wellness spans over the past decade and half & his work is heavily influenced by some of the most inspiring modern teachers, spiritual leaders & global influencers around the world. Lisette Cheresson is a writer, yoga teacher, and adventuress who is an avid vagabond, dirt-collector, and energy-practitioner. When she’s not attempting to create pretty sentences or reading pretty sentences other people have created, it’s a safe bet that she’s either hopping a plane, dancing, cooking, or hiking. 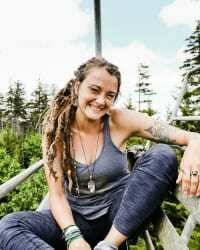 She is currently the Director of Digital Community at Wanderlust Festival.